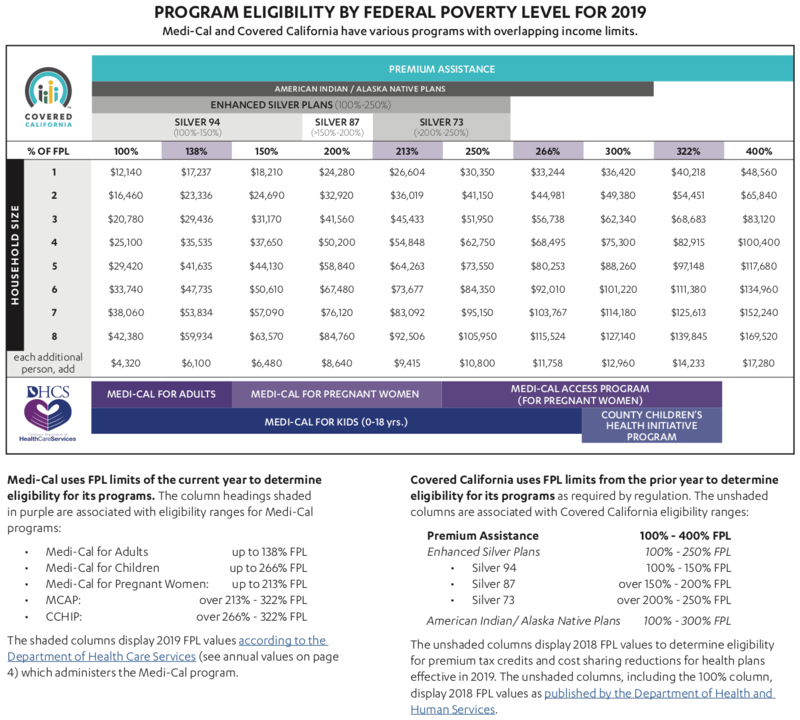 The Covered California income limits require consumers to have a household income that ranges from 0% to 400% of the Federal Poverty Level (FPL) in order to qualify for assistance on a government health insurance plan. Based on your household income, you may qualify for up-front tax credits when you enroll in health insurance in California through the Covered California Health Exchange. According to Covered California income guidelines and salary restrictions, if an individual makes less than $47,520 per year or if a family of four earns wages less than $97,200 per year, then they qualify for government assistance based on their income. If the family has a lower household net income, then a greater amount of government assistance is available to the family. Tax deductions can lower your income level. View the Covered California income limits chart below. 0% – 138% of FPL: You qualify for Medi-Cal. > 138% – 400% of FPL: You qualify for a subsidy on a Covered California plan. > 138% to 150%: You also qualify for the Silver Enhanced 94 Plan. > 150% to 200%: You also qualify for the Silver Enhanced 87 Plan. > 200% to 250%: You qualify for the Silver Enhanced 73 Plan. Pregnant women may qualify for MAGI Medi-Cal if you have household earnings of >138% to 213% according to Covered California income limits. Also, based on wages and the FPL, women who are having a baby may be eligible for the Medi-Cal Access Program (MCAP) if they have a household income of >213% to 322%. Adults qualify for Medi-Cal with a household income of less than 138% of FPL. However, according to the Covered California income guide, children who enroll on Obama Care California plans may qualify for Medi-Cal when the family has a household income of 266% or less. The children must be under 19 years of age to qualify. Also, C-CHIP, the County Children’s Health Initiative Program, offers health care coverage for children when the family income is greater than 266% up to 322% of FPL. Document proofs (including pay stubs, bank statements, etc.) may be required to verify your household income threshold. If you fail to provide proof of income, you may lose your Obamacare subsidy or your health care coverage. If your wages/salary increases during the year, this may affect what levels of subsidies you qualify for according to Covered California income limits. It also may affect whether or not you, your spouse or your children qualify for certain government assistance programs. If you have a significant income change mid-year, you may be required to report that to Covered California or to Medi-Cal.